The coastal region of Georgia, in contrast to such areas in most states, remains relatively undisturbed. Its extensive marshes, once regarded as unproductive wasteland, are now known to be highly productive ecological systems, extending their productivity to coastal waters (Odum 1961; Schelske and Odum 1961; Odum and de la Cruz 1967; Thomas 1966). Furthermore, they are now known to cover potentially valuable mineral deposits (Cheatum et al. 1968; Furlow 1969). The offshore islands beyond the marsh remain in a relatively natural state because of their inaccessibility and the good stewardship of those who have owned them. Their recreational potential recently has become a matter of considerable public and political interest (e.g. Keeling et al. 1968; Fraser 1969; Francisco et al. 1970; Clement 1971). The future development of the coastal region of Georgia is now of major public interest in Georgia, and various proposals for mining, aquaculture, recreational development, and preservation have stimulated much controversy in the legislature, in the local press and national magazines, and at public hearings. Much of the information needed for making management decisions is lacking. The information that is available is scattered through a variety of scientific journals, agency reports, and unpublished files and is often inaccessible or unintelligible to managers and planners. 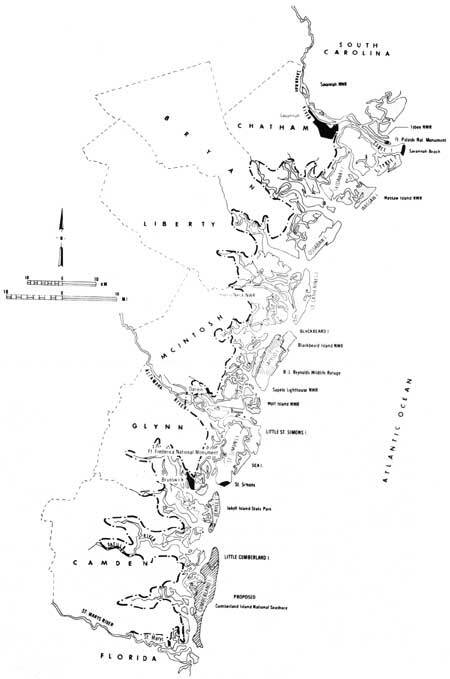 The objective of this study was to describe the overall structural and functional ecology of coastal Georgia, defined for purposes of this study as the region bounded by the mean high-tide mark on the mainland extending eastward to include the marsh-estuary system, the offshore islands, and the adjacent marine areas of the continental shelf (Fig. 1). The procedure involved extensive review, interpretation and synthesis of existing information, supplemented by aerial and ground surveys. Data on the islands, especially, were lacking and much of the field work was devoted to surveying the vertebrate fauna and vegetation of the islands. Aerial surveys were made in order to inventory wading bird and sea turtle rookeries, and additional information on vegetation and wildlife was acquired through ground surveys. In addition, there were extensive efforts at trapping and collecting mammals, amphibians, and reptiles. Inferences from outside the study area were drawn upon when necessary. In order to characterize in some detail the ecology of such a large and diverse region, we have separated it into smaller, more homogeneous units. The units of discussion are the major habitat types: the islands, the marshes, and the open marine and estuarine waters. It must be emphasized that the habitats are interacting components of a larger system, which is itself not a closed system that is isolated or insulated from others. It is a dynamic system through which materials and organisms constantly move to and from other areas and is therefore not easily delimited by artificially drawn lines.